Sometime we overlook the spell check on blog posts or site articles, these errors may give your visitors a bad impression about your site. 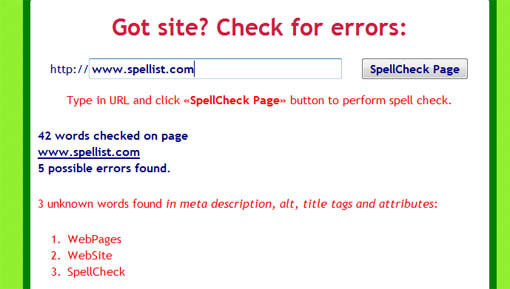 Spellist is a new service that finds spelling mistakes on your site. Just enter the URL of the site you want to check for possible spelling errors, it checks the site and shows your the possible errors in both content and meta tags. It won’t fix any errors but it just gives you the list of possible spelling mistakes, you can fox these errors for yourself. Not bad. I may have to bookmark that site just as a quick check for my sites! In theory this is a great idea, however when I tested it on my site, some of the words that it came up with, that were incorrect are not on my site. At least I cannot find them. You should be able to click on the word and Spellist should take you to the page with the word on it. You never know, that might come on a later release.